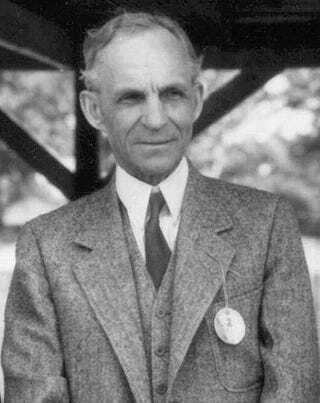 Did Henry Ford's Lost Predictions For 2011 Come True? In September 1931, The New York Times asked Henry Ford and several other public figures to look eight decades in the future and predict what life would be like in the year 2011. Forgotten until now, here's what Ford forecast. When he wrote the piece headlined "The Promise Of The Future Makes The Present Seem Drab," Ford was just crossing the summit of his professional life. Wealthy beyond imagination from the family-owned Ford Motor Co. that was building one-third of the world's automobiles every year, Ford's public image was recovering from a trial over the anti-Semitic newspaper and books he published, culminating in an 1927 apology. Within a few months of his predictions, Aldous Huxley's "Brave New World" would swap Henry's name for God's, marking future time in "Anno Ford." "No doubt the seeds of 1931 were planted and possibly germinating in 1851, but did anyone forecast the harvest? And likewise, the seeds of 2011 are with us now, but who discerns them?" Instead, Ford fell back on the idiosyncratic idealism that led him to double his workers' wages but then hire a platoon of social workers to investigate their private lives, to oppose World War I as "wasteful," then turn his plants over to building armaments. What he seemed most worried about was wealth corroding character, something on many minds following the 1929 stock market crash. "Material increase," Ford wrote, "is definitely checked by moral decrease." The other prognosticators, whose predictions were recovered from the vaults by the blog of a South Carolina law firm, were far more specific, hailing the benefits of better medicine and technology. One forecast bigger cities, higher divorce rates, larger government and that "personal property in mechanical conveniences will be greatly extended." We shall go over our economic machine and redesign it, not for the purpose of making something different than what we have, but to make the present machine do what we have said it could do...The only profit of life is life itself, and I believe that in the coming eighty years will see us more successful in passing around the real profit of life.